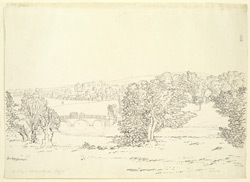 An outline view in ink of John Vanbrugh's Grand Bridge, which, whilst spanning the lake, is the focal point of 2000 acres of parkland. When it was first built in the early 18th century it was considered too ostentatious and ill-suited to its surroundings. Daniel Defoe, who visited in 1720, complained there was little justification for "a bridge or ryalto rather, on one arch costing 2000l. and this, like the bridge at the Escurial in Spain, without a river". It was given a more appropriate setting by Capability Brown who dammed the river to form two long lakes meeting at the bridge.